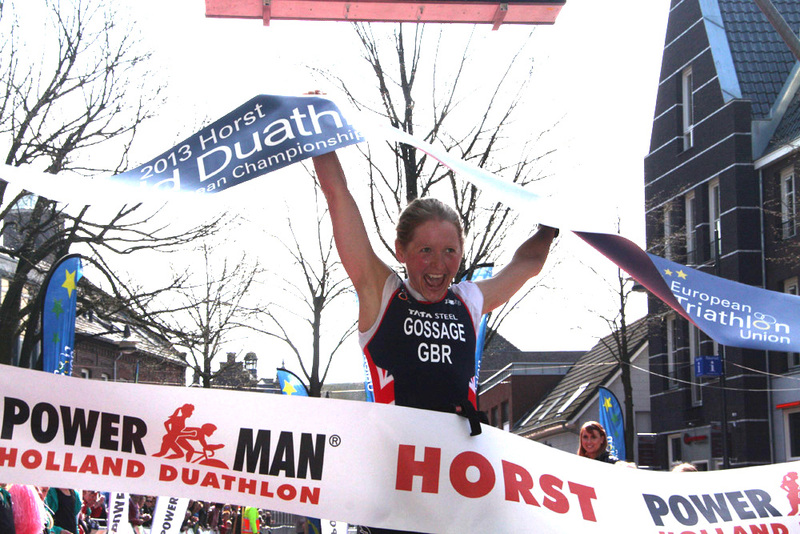 Lucy Gossage produced a supreme performance to win the ETU Powerman European Long Distance Duathlon Championship in Horst. The British athlete dominated the race from start to finish and despite a late challenge from Sweden’s Eva Nystrom, a delighted Gossage crossed the line over a minute ahead. Nystrom was secure in second place and 2011 World Duathlon runner up Jenny Schulz claimed her first European Duathlon podium with a third placed finish. A fired up Gossage set a pulsating pace immediately and was joined by Sabrina Monmarteau (FRA) and Schulz (GER) as a lead group was established. Nystrom and compatriot Camilla Lindholm were some 15 seconds behind. By the end of the 4th lap, Gossage, Monmarteau and Schulz had increased their lead with Nystrom isolated in 4th place as Lindholm fell further behind. Monmarteau exited transition first but by the end of the first bike lap Gossage had powered into a healthy lead. Nystrom was the most impressive performer on the bike as she not only moved up into second place but closed the gap behind Gossage to twenty seconds. By the end of the third 20km bike lap, Nystrom had closed the gap again and she left transition together with Gossage and very much in striking distance. Jenny Schulz was maintaining her form in third place but the early challenge of Monmarteau faded as the French athlete dropped out of contention. However, Gossage excelled again on the final run segment as she pushed hard to leave Nystrom trailing. With two laps to go she had increased her lead to ten seconds and by the last lap her victory was never in doubt.